Last week I made a whirlwind trip to Southern California to visit with friends from Portland who were renting a condo in Palm Springs. It truly was a crazy trip: drive down Thursday, drive back Sunday. But I love road trips, and I love the desert, so how could I say no? Especially when I had the opportunity to combine it with a brief visit with another friend, Luisa of Crow and Raven. I saw wonderful gardens and plants, I took lots of photos, and I will have quite a few dedicated posts. For now, I want to tease you with a few collages. My first stop was at Jurupa Mountains Discovery Center in Riverside. I met up with Luisa in the afternoon, and we enjoyed photographing the succulents (the aloes were in full bloom!) and shopping in the nursery. 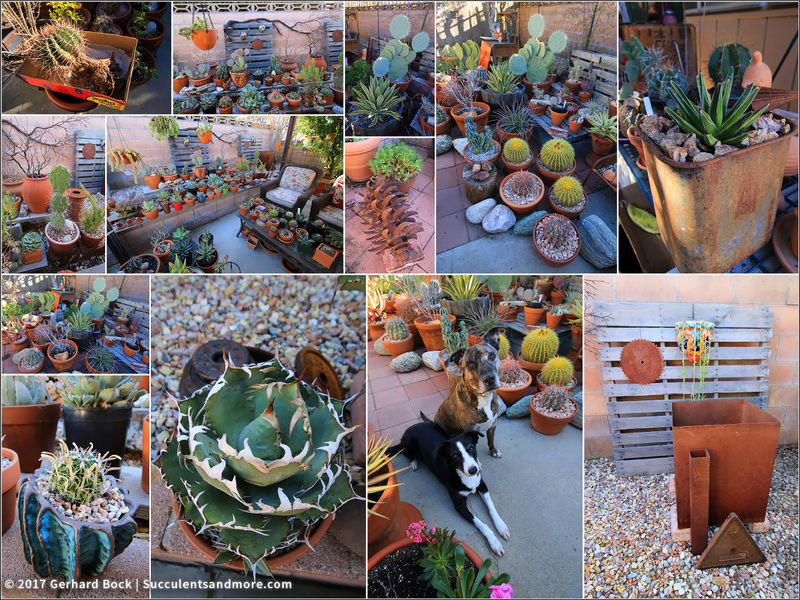 I spent the night at Luisa's house and had the opportunity to admire her extensive collection of containizered succulent on Friday morning. She has quite a few special plants as well as awesome containers she found at industrial salvage stores. Not to mention three sweet and loving dogs. After I met up with my Portland friends in Palm Springs on Friday, we visited Sunnylands in Rancho Mirage. 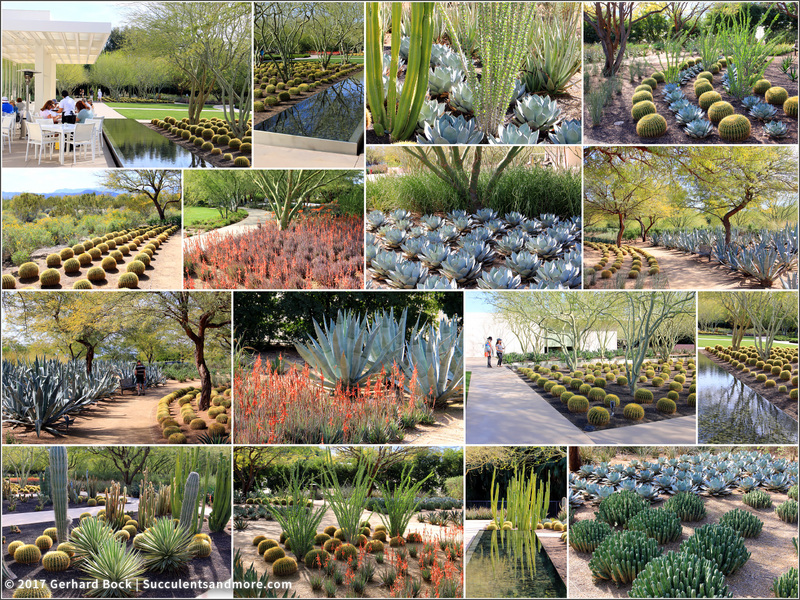 I had blogged about Sunnylands before, and I'm happy to report it's still as awesome as it was in 2015. Maybe even better because the plants have gotten larger. Walking around the extensive grounds in 80+ degree weather was a vivid reminder that Southern California is very different from where I live, especially in the winter. 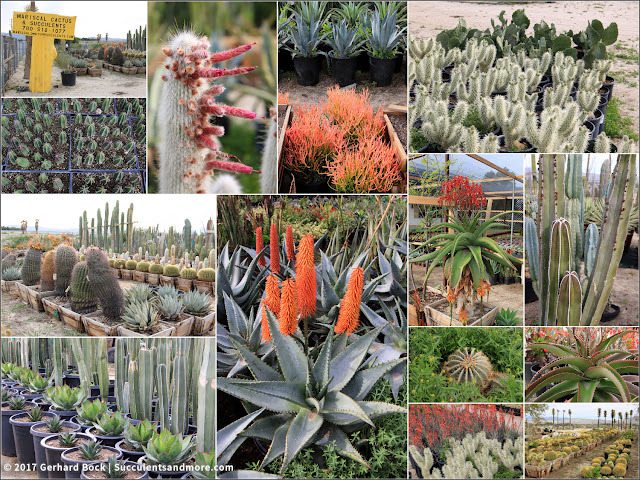 Saturday began bright and early with a visit to Mariscal Cactus & Succulents in the town of Desert Hot Springs. I had stopped there in January 2015 on my way back from Arizona but nobody had been around to help me. The nursery continues to be well stocked although some plants are drowning in weeds that have sprung up in recent weeks. For the record: I bought another barrel cactus (Ferocactus), species unknown. Our next stop was Cabot's Pueblo Museum in Desert Hot Springs. 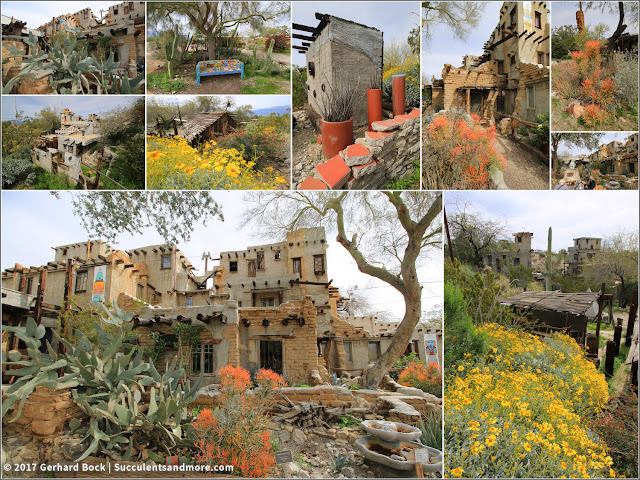 This Hopi-style pueblo with 35 rooms was built by Cabot Yerxa, a homesteader who settled on the 160-acre plot in 1913. He built the structure mostly by himself, and it opened as "Cabot's Old Indian Pueblo" in 1945 after 24 years of construction. I'll have more about this unique place in a separate post. Stop #3 on Saturday was another nursery, Sunland Cactus Nursery in Indio Hills. I had read about it in Sunset Magazine and was eager to check it out. Sunland is similar to Mariscal (see above), but it's even larger. Since it's a wholesale nursery, the focus is on landscape-ready specimens. There isn't much of a selection of smaller plants (in pots smaller than 5 gallon) and virtually nothing is labeled. 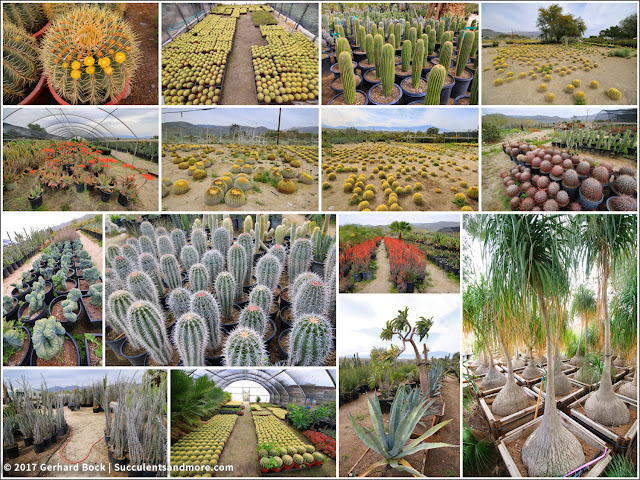 Still, this is the kind of place you want to go to if you need a large cactus or palm tree for your yard. 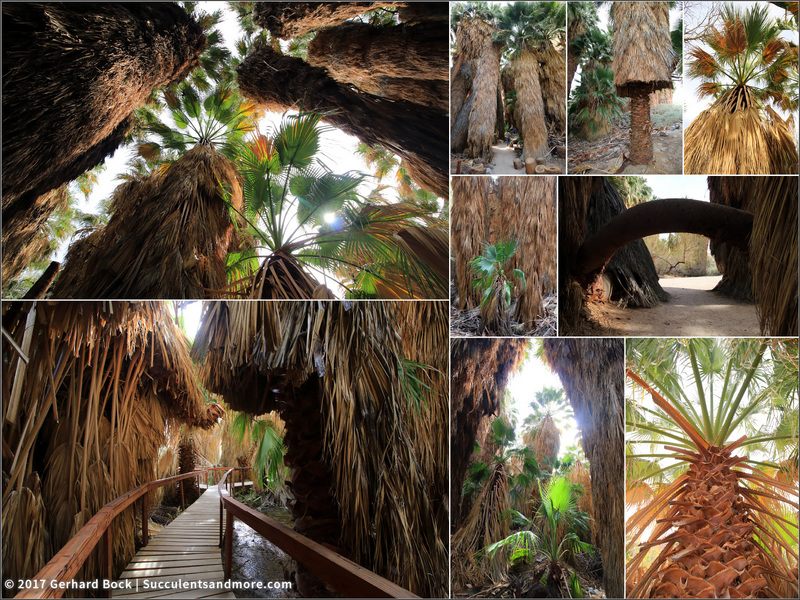 Our final stop on Saturday was the Thousand Palms Oasis in the Coachella Valley Preserve. I had been wanting to visit for a long time, and I was excited to finally walk among the towering California fan palms that grow naturally in this wetland formed by water seeping from the San Andreas Fault. This is one truly special place, as you can see below. On Sunday, it was time to head home. 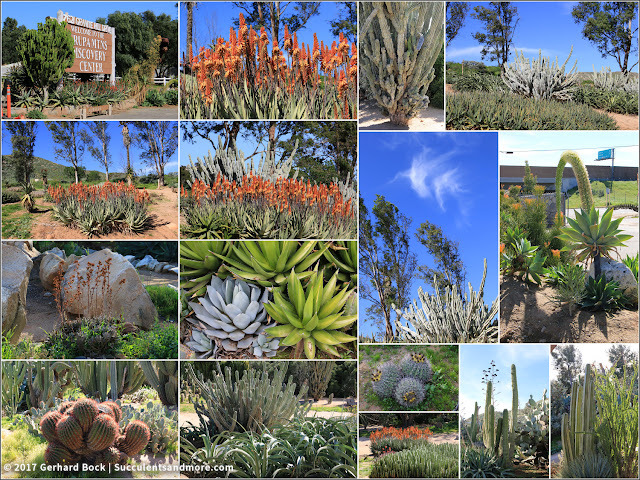 I had originally intended to make the 8-hour drive without any major stops but on the spur of the moment I decided to stop at the Los Angeles County Arboretum & Botanic Garden in the town of Arcadia. It is literally just off the freeway--and a mere five miles from the Huntington. Because of that, it sometimes doesn't got the recognition it deserves. No, it isn't quite in the same league as the Huntington, but then what is? Even after my all-too-brief visit, I can confidently say that if the Huntington didn't exist, the LA County Arboretum would be the most celebrated botanical garden in Southern California. It really is that impressive, as you can see below (and yes, there are peacocks--many peacocks!). I've been slammed with work since I got back, but I will start posting detailed reports very soon. You DO make the most of each and every trip you take, Gerhard! 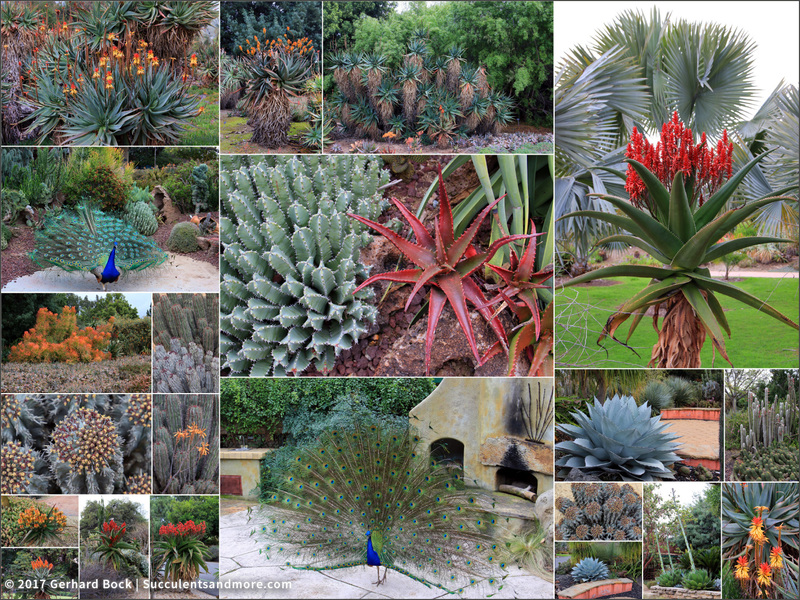 I've lived in SoCal my entire life and have probably seen fewer of its plant highlights than you have. Wonderful photos, as usual, and I look forward to seeing your more detailed posts when you surface from your work overload. For the record, we hit 80+ here today too, courtesy of the Santa Ana winds. Kris, I'm very familiar with the situation you describe. All of us tend to explore areas further afield more thoroughly than our own backyard :-). We're finally creeping into the low 70s here in Davis. It's been a good 10°F colder than normal. It was quite a shock coming home from Southern California. I'm so glad you got to go visit those guys, they planned their trip well...escaping our never endeding cold and wet. They must be in paradise! I'm impressed with all you crammed into that short trip and can't wait to see more. Was this your first visit to the LA County Arboretum? For some reason I thought you'd been before. It's a jewel! This was my first visit to the LA County Arboretum. I only had time for the South African and New World sections, not even for the Australian garden. But next time!! What a whirlwind trip! You must have been in succulent heaven :) I haven't been to Palm Springs and surrounding areas in forever. I am saving this to see about a trip. I was born in Hemet and still have family there and in Temecula. I look forward to more photos! Palm Springs has changed a lot. While there still are some country clubs and resorts with too much lawn and too many fountains, landscaping in general has changed to much more appropriate plantings. And the climate in the winter can't be beat! You packed a lot of plants into a quick trip. Looking forward to the details. I'm glad you got to see a bit of the LA Arboretum. There's a lot of good stuff there. I honestly had no idea the LA County Arboretum was that awesome. In hindsight, I shouldn't have been surprised. I felt a slight tremble in the garden blogosphere -- Gerhard in SoCal again (via Instagram)! Glad you had a great time. I will say you're not afraid of a drive! If I had had one more day, I would have emailed y'all about meeting up somewhere. Our get-together at the Huntington last year was so much fun. Next time, I promise. Maybe in the fall or winter. And no, I'm not afraid of driving. I listened to an entire audio book, and it turned out to be a fantastic one: The Garden of Last Days by Andre Dubus III). You sure did pack a lot of locations into your trip. Hadn't heard about Sunland Nursery even though I live close by. Will check it out. Do check it out. You might find something cool. I found a 1-gallon Euphorbia tirucalli 'Sticks on Fire' for $6. I know, it's like a weed in Southern California, but it's exotic where I live (and my other one looks like **** because of our rainy winter). Thank you for taking me to the Jurupa Mts Discovery Center. What a gem right in the middle of civilization. But because it's so large, it felt remarkably off the beaten path. I looks like spring is finally here in Davis. It was so cold when I got back last Sunday! I'm so happy I stumbled upon your blog! I'm in Rancho Mirage right now, visiting my mother. I'm new to the succulent & cacti world and am quite obsessed :) thank you for all of this well written information and photos! I've learned a lot reading these entries and the ones from 2015!